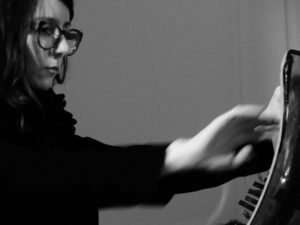 Musical Ecologies continues Thursday March 9th with Brooklyn-based pianist and composer Teodora Stepančić. A native of Serbia and a recent arrival to New York City, Stepančić seeks works for the piano that speak in the voice of the outsider, a hushed voice, that does not try to draw attention to itself, and that stresses generosity, attentiveness, intimacy, spirit and focus. This focus also informs her own compositions, into which she often incorporates theatrical and visual elements. She will perform a one-hour program of piano works by Assaf Gidron, Hollas Longton, Tom Aldrich and her own For pianist and helperformer. The evening will begin with a conversation hosted by series curator Dan Joseph. Teodora Stepančić was born in 1982 in Belgrade, Serbia and is currently based in Brooklyn. She is a core member of Ensemble Modelo62 (NL), Ensemble Studio6 (RS), Stepančić-Gidron duo (US), and frequently collaborates with different new music ensembles as pianist and composer. She regularly performs in Europe, Middle East, North and South America and appeared on festivals such as BBC Proms (London), Gaudeamus Music Week (The Netherlands), Summer Course for New Music Darmstadt, Zwei Tage Zeit (Zurich), Hawler International Theater Festival (Erbil). Teodora holds master's degree in piano and composition from the University of Art in Belgrade and the Royal Conservatory in The Hague. She also graduated from the ballet school in Belgrade. Comments closed — Trackbacks closed RSS 2.0 feed for these comments This entry (permalink) was posted on Monday, February 13, 2017, at 12:00 pm by Dan Joseph. Filed in press release.